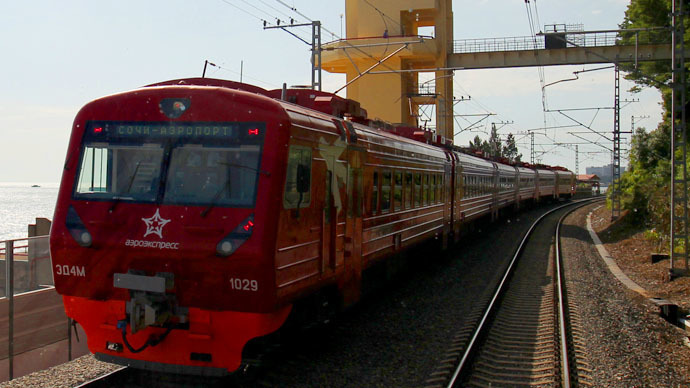 The 'Razvitie' Trans-Eurasian Belt is a multibillion dollar infrastructure megaproject, led by Russian Railways (RZD). It is expected to create at least 20 million new jobs in Russia over the next two decades. The plan has been in the works for many years, and the economic crisis is the best time to move from words to action, according to Ruslan Grinberg, the head of the Economic institute of the Russian Academy of Sciences who spoke to RT at the Dialogi economic discussion club in Moscow. “Crisis is always the appropriate time to realize megaprojects. EconomistJohn Maynard Keynesinstructed that you if you don’t have demand you should construct Egyptian pyramids in Britain, so that people went to work, earned money. While they are not needed there, we do need them, as they create jobs and a fantastic multiplier effect. One unit of money invested creates at least 1.5 units,”Grinberg said. There are two strategic aspects in the project, he said. “One is a transit corridor between Europe and eastern Asia, established with all the modern and ‘smart’ functions. Second, it’s the creation and the development of a network of industrial economic corridors within the territory of the Russian Federation,” he said. The project will involve some European countries, like Italy, Austria and Germany, as well as various countries within the former Soviet territory and Eastern Asia, including Japan, South Korea, China, Mongolia, Ohashi said. “But Russia should keep the door of this project open to any interested country and every interested enterprise, and I’m sure Russia will do that,” he added. With a minimum cost estimated at $20 billion, the project will bring much more to all of the participant countries and reshape the world economy, experts agree. “The project can eventually change the world economic map because Russia is going to provide a concrete new stage for businesses in Eastern Asia and Europe. They can choose either sea routes, or the Trans-Siberian route or the so-called China land bridge through Kazakhstan,” Ohashi said. If Russia implements the project successfully, it’s likely to get a high economic growth rate of 6-7 percent in about two or three years, Ohashi added. Trade between Europe and Asia will increase by at least 50 percent, and the transportation time will be cut from 45 days to 13, Grinberg projected. Russia has already cut the time of container shipments between Europe and Asia to about two weeks from 20 days, the CEO of United Transportation And Logistics CompanyPetr Baskakov told RT. “But there’s still the potential to cut this transit time by another 20 percent, which will bring land shipments closer to airline shipments in terms of competitiveness,” Baskakov said. The investment into the 'Razvitie' project won’t have a quick return as the first profit could be expected in about 7 years, Grinberg said. “Anyway, this project is important for the economic growth in Russia’s Far East, as the labor force there is moving away, which is blocking development of the eastern regions,” he said. While economic ties between Russia and Europe have been tight, a scope for bringing the economies of Russia and Asia closer together is tremendous, Ohashi said. “If you look at the economic relations between Europe and Russia, they are based on energy dependency. It is very clear that if Russia stops supplying energy the European economy will suffer. The Russian market is full of European goods and services, so that interdependency is very big between Russia and Europe. The route will stimulate increased trade between Russia and Asia. The very meaning of this project is that Russia and Asia will increase economic ties,” he said. Running a business in Russia remains ‘unique’ compared to all other places in the world and the Razvitie project is expected to change this, Ohashi added. “Other countries are pretty the same, for example Japanese investment into India, Japanese investment to China, to Poland – all is the same. The Russian business space has been qualitatively different from the rest of the world. I believe this megaproject is going to change this, so that Russia can become a part of the world economy,” he said.